I’ll be entertaining on Wednesday for an early Thanksgiving get together with friends, which I’m really excited about. This will be my first time entertaining in my house, so I want to make a good impression on everyone. Thinking of fall, I love the scents that come along with this season. With everyone coming over, I started to think of ways that could make my house filled with an inviting aroma. Of course there’s the traditional candles, plug in air fresheners and the sprays, but I wanted to do something unique. 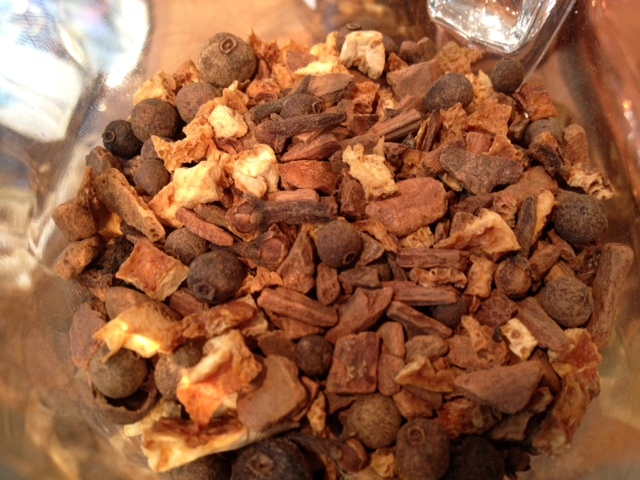 This is when it dawned on me – make my own house scent! Fill Crock-Pot with water and turn on medium heat setting. 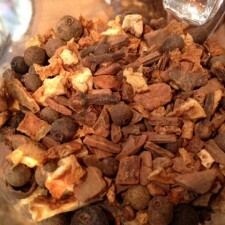 Add in cinnamon chips, orange rind, whole allspice, and whole cloves. Stir together. Next, add in melted coconut oil and drops of orange oil. Stir again, combining all ingredients. After about 15 minutes, turn the heat down to the lowest setting to simmer. Refill water as needed and enjoy the aroma! Feel free to add whole orange slices and cinnamon sticks to make this even more visually appealing for those guests who want to take a peek at this creation. I chose to set my mini Crock-Pot in the corner of my kitchen, which still gave off enough scent for the house, but wasn’t in the way of things. You can really get creative with this idea, even adding in cranberries, dried apples, and cinnamon essential oils for a different scent. For this gathering, I’ll be making brown sugar glazed ham, mashed sweet potatoes, and baked apples for dessert – all used with coconut oil as a substitution for butter.